We want you to walk with the program and take full advantage of everything XL Future Leaders Program has to offer and, in doing so, we encourage you to take appropriate personal and collective precautions when joining, travelling, learning, mentoring, working, and playing with XL Future Leaders Program. We take your intention very seriously and we want you to do the same. Your progress is, and always will be, our greatest concern. We want you to know that we are always here supporting you. Now, we are pleased to announce 150 students that have been accepted to study with XL Future Leaders. 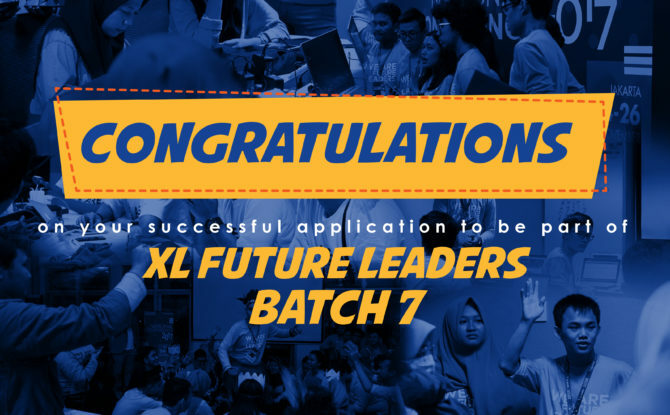 Congratulations on your successful application to be part of XL Future Leaders Batch 7!! The selected students will have the privilege to experience a two-year program with us, and we feel certain you will find your experience at the program both challenging and rewarding. Upon your acceptance, we are delighted to invite all Batch 7 students to attend XL Future Leaders National Conference on November 24-25, 2018 in Jakarta. All successful students will receive an official email from XL Axiata. Please check your inbox to confirm your acceptance. We are eagerly awaiting your response and we are at your full disposal for any additional information and/or any assistance you might need at this point. Again, we thank all applicants for such endurance and patience walking through all stages to join XL Future Leaders. For those who are not accepted at this year’s XL Future Leaders, please sign up to our online module on www.elearn.id to open more door of opportunity to improve and excel. Never give up! For the National Conference in November, air travel for students studying outside Jabodetabek will be funded by XL Axiata. For students coming from Bandung, group travel bus will be provided at XL Center Bandung (detail will be informed). Meanwhile during the event, all accommodation (hotel and land transportation) will be provided for all students.